THE GRAND CANAL is one of the wonders of the world. Built in the 7th century by CHINA’s Sui Dynasty, it stretches about 1,100 mi (1,800 km) across eastern China—about the same distance as MIAMI, FLORIDA, to NEW YORK CITY, or LOS ANGELES, CALIFORNIA, to Vancouver, CANADA. 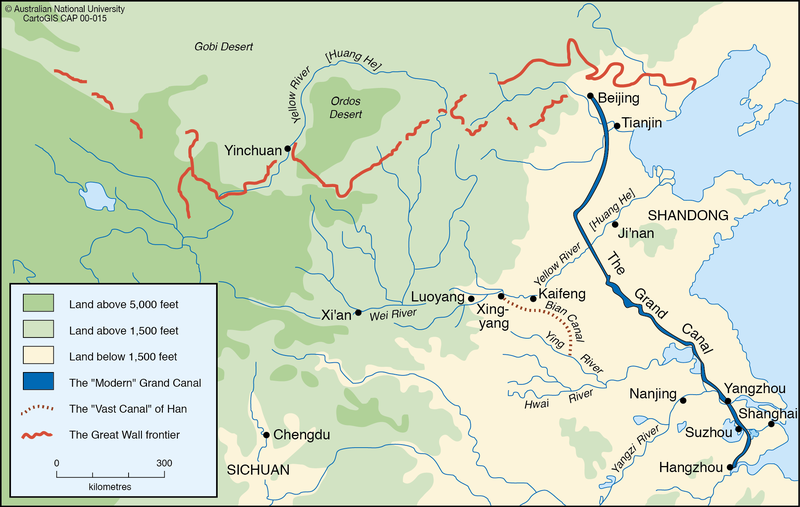 The canal was built to transport rice and silk from the rich and fertile south to the dry and barren north, particularly to soldiers protecting the frontier and the northern capital, BEIJING. Major cities grew up along its route, which remain major commercial centers to this day, although much of the canal is now too small or too full of silt to carry major boat traffic. The Grand Canal, Da Yunhe in Mandarin Chinese, has been called the “Bridle on the Dragons” since it crossed China’s five major east-west rivers and helped control perennial flooding in the region. Throughout China’s history, dynasties could rise and fall depending on their ability to control these floods; natural catastrophe was a sign of displeasure from the heavens and frequently led to change in regime. Sections of the canal were built as early as the 4th century B.C.E., though most of it was undertaken in the 7th century C.E. by the notoriously cruel Emperor Yangdi: The forced labor of millions of peasants accomplished a nearly complete canal in only six years. It linked the southern city of Hangzhou to Xi’an (then the largest city in the world), and from there trade passed overland via the SILK ROAD to western Asia and Europe. The canal still begins at Hangzhou, capital of the 13th-century Song Dynasty, which was visited by Marco Polo, who described it as the most magnificent city in the world. 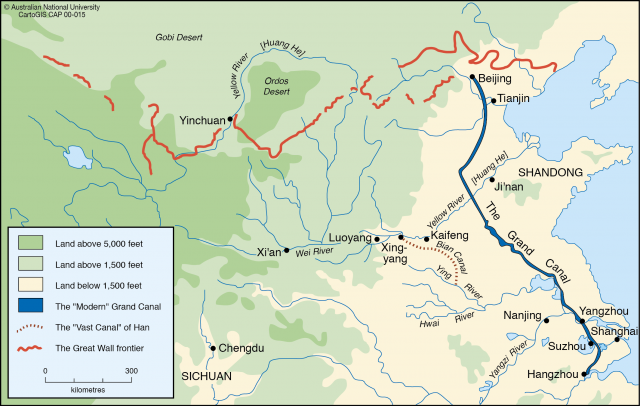 When the Mongols (Yuan Dynasty) set up a new capital at Beijing in the next century, the canal was extended further north to feed the capital and its armies with rice from the south. Heading north from its terminus at Hangzhou, the Grand Canal crosses the provinces of Zhejiang and Jiangsu, where it passes through the city of Suzhou, sister to Hangzhou. Both cities are famous for their gardens and natural beauty (Suzhou is sometimes referred to as the “Venice of the East” because of its extensive canals). The canal forms the main street for commercial cities like Wuxi and Xuzhou, where hundreds of small junks compete for space with larger barges, loading and unloading products—silks, rice, green tea— onto train lines that reach far into the Chinese interior. The canal then intersects the Changjiang (Yangzi River) about the midpoint between two of China’s most important cities, Shanghai and Nanjing. Following the contours of the North China Plain, the canal is at its deepest and widest, enough for 600-ton riverboats. Small rice plots surround the canal for miles. The landscape begins to change as the waterway enters Shandong Province: plaster and tile houses of the south give way to mud and thatch in the north, wheat replaces rice as the dominant crop, and mules replace water buffalo as the major domesticated animal. This region is heavily affected by drought and floods, and much of the region’s trade has shifted to railroads, leaving many sections of the canal completely dry, with much of its water used for irrigation. The canal no longer enters the Huang (Yellow) River, which has risen about 20 ft (6 m) on silt deposits, kept in by dikes. From the Huang River, the canal works its way north through Hebei Province to Tianjin, the port city for Beijing. Formerly connecting Beijing to its port, the canal is now unnavigable between the two cities.